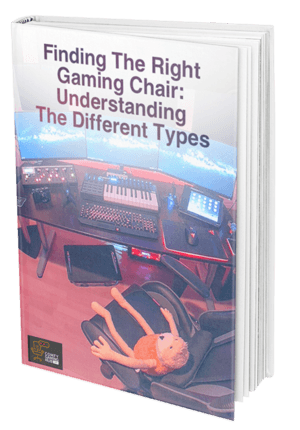 Maybe you’ve already heard of gaming chairs and are at least a little enticed. The problem is that there are all these chairs for around 500 dollars that require a masters in structural engineering to assemble. 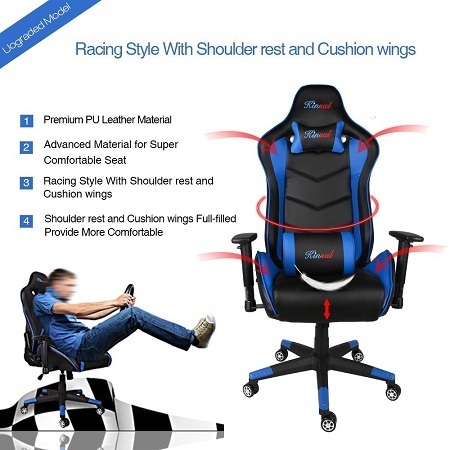 Maybe you want a gaming chair, but you need something more simple. 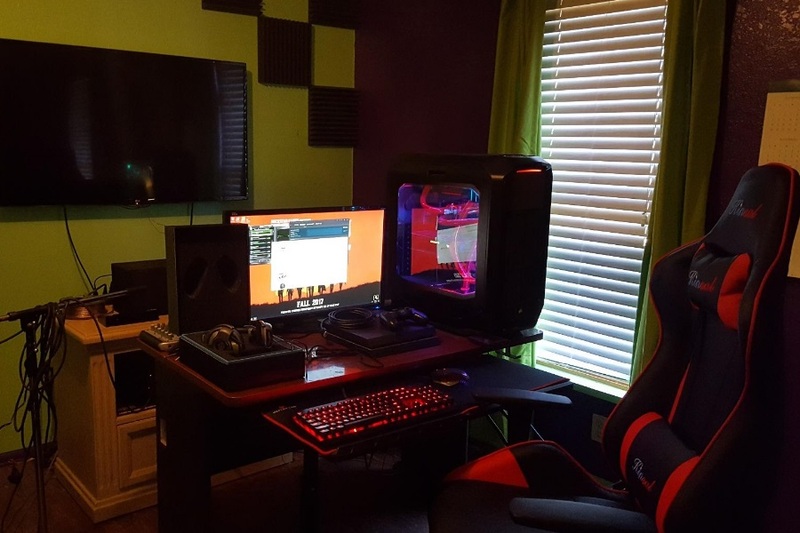 You don’t have to settle for an ugly and tiny gaming chair. There are great affordable options that you can capitalize on. Durability - If you are using a gaming chair, chances are you plan on using it for super long sessions. 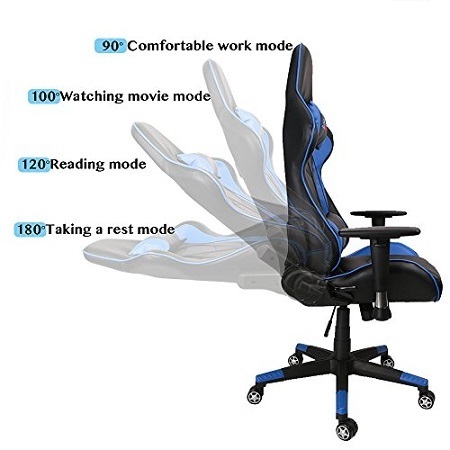 If you’re the type to game for 8 hours or more, it makes no sense to pick a chair that won’t last you halfway through a long RPG. Comfort & Support - This is your cockpit. If it doesn’t look like it will be a comfortable ride, then it’s not a wise investment. You need proper support to prevent your back from aching down the road. Adjustability - Not everyone is exactly the same. 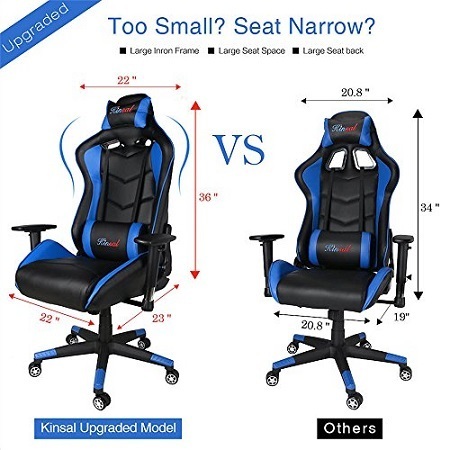 Though these gaming chair companies try their best to build chairs for specific molds of people, some people may need slightly higher angles than others. If your chair doesn’t include the possibility of adjustment then you might get stuck in a less than ideal position. These are the three essentials for a good gaming chair. Anything else is just glitter and glam. Nothing specified above requires extremely costly construction. For this reason it is a no brainer that you can find one for a good price. There are several options that satisfy these requirements, but today we will be discussing the Kinsal Ergonomic Leather High-Back Swivel Chair. 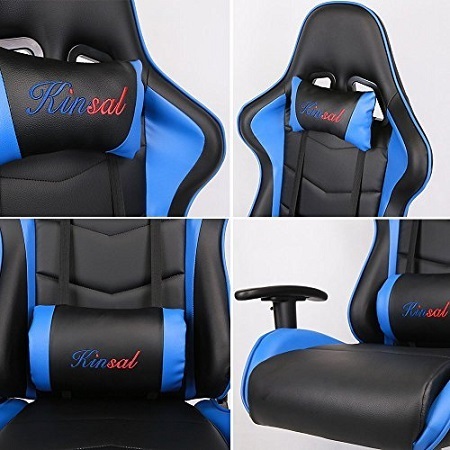 The Kinsal is one of the few high-quality chairs for under 200 dollars. The Ergonomic Leather High-Back Swivel Chair is suitable for big and tall folk. You have the options of blue, green, orange, red, and white. Support Cushions - Lumbar support pillows keep your lower back healthy and headrest cushions keep your neck feeling good. 360 Degree Swivel - As it is a rolling chair, there is a 360 degree swivel. ​Backrest Adjustment - You can be all the way from 90 degrees straight to 180 degrees all the way back. ​Rolling Wheels - Based on racing wheels, the wheels roll silent. ​Gas Spring Height Adjustment - There is a gas cylinder spring that allows you to adjust your height without sacrificing suspension. Tough Frame - The chair comes in a tubular steel frame with a star base. The chair is mostly black, so the color you choose will be mostly accenting the black. You will find the Kinsal Swivel Chair mentioned first on egaming’s list for best gaming chairs for 2016. The chair has just under 500 reviews on Amazon. 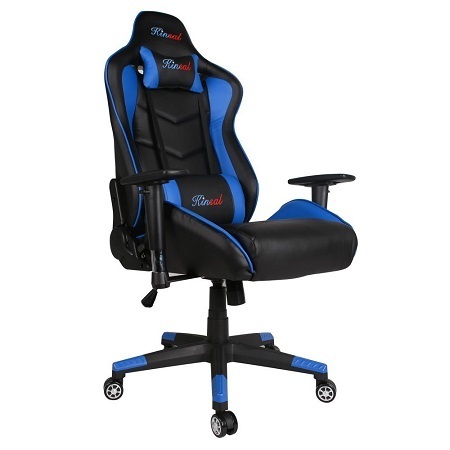 For almost half the price of most gaming chairs, the chair comes in at a great bargain. For the first few months, the product will feel like a steal. The public seems to be impressed with the comfort of the chair, most notably the lumbar support. Also, the backrest adjustability appeals to a large portion of customers. The seat is very comfortable, without a doubt. I found it to be just as comfortable as the more expensive chairs. Not many people seemed to have difficulty assembling the chair. It took me only a few minutes, it was much easier to assemble than any other gaming chairs i’ve ever used. It only needs 8 screws. The chair is not perfect though. You are paying a fraction of the price of most gaming chairs so some sacrifices need to be made. To me, the armrest was a little bit too small. As a larger person, I would have liked to see larger armrests. My chair was not squeaky and in fact, it has lasted me well over a month, but some negative reviews say that after a few months the chair gets a little squeaky and flimsy. Most people are satisfied with the longevity, but since it is cheaper, there is no doubt that there will be some added risk to the chair's durability. If you notice anything in the first 30 days you can get a free exchange or refund. If you are a constant gamer, you should be able to notice any underlying problems in the first month. If something happens down the road, reviews share that the customer service folk are helpful and will usually give you at least a partial refund or help with an exchange. Although the chair isn’t perfect, for it’s price, it seems to be far ahead of the competition. It looks great and is quite comfortable. You won’t be able to find a comparable chair in the same price range. I used it as an office chair as well as a gaming chair. It suited me for both needs well. I am a larger individual and it is clear that Kinsal had a larger individual in mind. They also have a model for smaller people, but I appreciated that taller and wider backrest that fit my body. Kinsal doesn’t have their own distribution channels, so my recommendation is to buy this chair through Amazon. It is on the prime list which means you can get free 2-day shipping. Both the smaller and larger models come in at under 200 dollars though the large model is a little bit more expensive. After 30 days, Amazon will still replace damaged or defective parts for free. Is this the best gaming chair out there? Certainly not, but it is definitely the best one for under 200 dollars. It’s not perfect, but it satisfies the checklist for what you need in a gaming chair. Make sure you check to see if your chair will last a long time and give it some heavy use in its first 30 days. That way you can send it back for a new one if you get stuck with a lemon. What are you waiting for? If you need a chair for gaming but don’t have hundreds of dollars to spend on it, then the The Kinsal Ergonomic Leather High-Back Swivel Chair is for you.